Wriggletto has been bringing Music Together classes to Cork families for 12 years now - so we know how much babies, toddlers, pre-schoolers, and big kids all love Wriggletto! Our playful music classes for wee ones support every child, regardless of their learning style or stage of development. 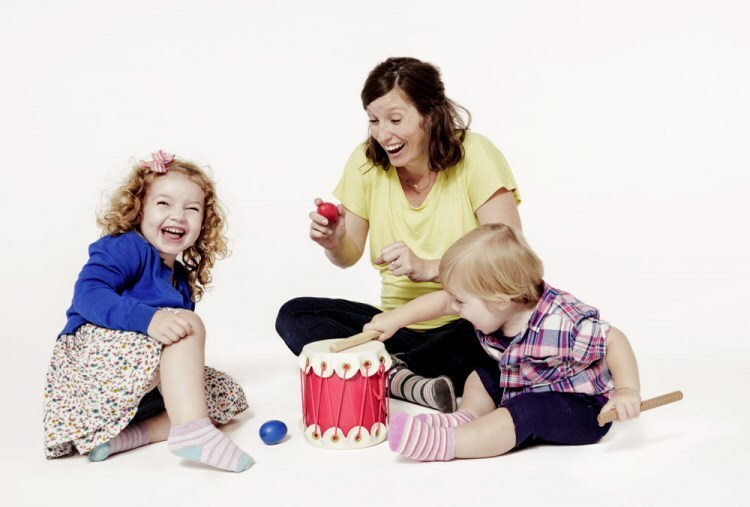 Each weekly class includes lots of music activities especially created for young children, led by your trained teacher Mairéad, who inspires everyone to join in the fun. Explore the classes offered at Wriggletto to find the best fit for your family. ● Mixed-age Music Class: For newborn to 5 year olds and their grown-ups. Learn and play musically together! ● Babies Music Class: Currently this class is available by request only. Babies 0-8 months old are most welcome and are encouraged to join our Mixed-age classes. Our Spring term presents eight 45-minute classes that include songs, rhythmic rhymes, movement and instrument play. These activities are presented as informal, non-performance-oriented musical experiences, developmentally appropriate for children and easy for parents and caregivers - regardless of your own musical ability! One CD, a code to access Music Together's Family Music Zone and a songbook are included, along with a booklet for parents: "Music and Your Child - a Guide for Parents and Caregivers". Pressed for time? Listen to our short radio interview to hear all about Wriggletto's music and movement classes for babies and pre-schoolers! When classes are listed as 'preregistration only', registration is limited to current and previous families for a set time, after which remaining spaces are made available to new families. For specific Priority and Open registration dates for each term, please see here. Mondays & Wednesdays at 9.45, 10.45, 11.45 , and 12.45. Dates for our Autumn term, starting mid-September will follow (during August). See our term schedule below. "Mairead copes with all the various needs of the participants as well as making a very varied, fun musical experience. Classes are very well organised and varied while still working to a theme. They are action-packed, with a variety of instruments, activities and movements, while still being safe, structured and comfortingly familiar. Mairead oozes positivity, love of music and passion for her work and as a result everyone feels included, nurtured and guided in a fun atmosphere." Caitriona H, Wriggletto parent.